Brick makes a durable, attractive facing for a house. 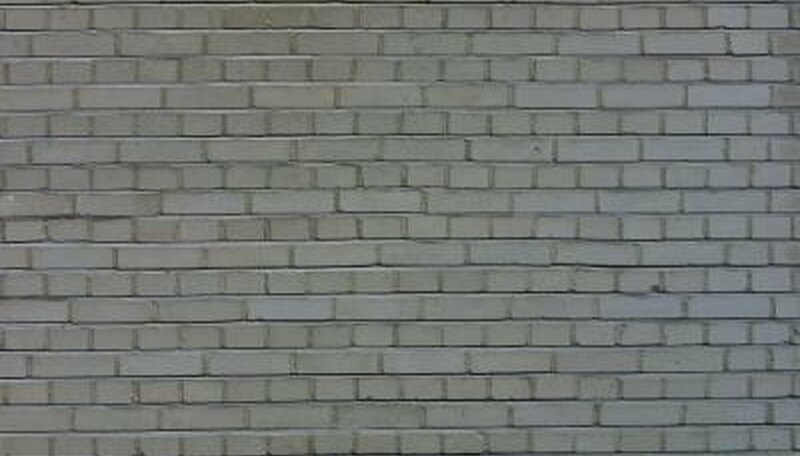 Brick comes in many colors and styles and can be installed in a variety of interesting patterns. Basic bricks are about 2-by-4-by-8-inches, but larger sizes are available. Special facing bricks have smoother surfaces and more regular edges and are made especially for house siding, but common bricks -- the typical red brick -- and used bricks recovered from old buildings also may be used and are popular with some homeowners. Whatever style you choose, it must be rated for exterior use, either SW for severe weather or MW for moderate weather. Start an exterior brick installation with a solid brick ledge, a 4-inch wide concrete base normally poured as part of a house foundation. If the house does not already have one, you will have to make a brick ledge. With a spade, dig a trench 4 inches wide and 8 inches deep along all walls where brick will be installed. Lay in 4 inches of 1/2-inch gravel and compact it firmly, then pour over it 4 inches of concrete. Level the concrete with a long board and level and smooth it with a mason's trowel. Let the concrete cure at least three days, preferably a week. Mix mortar with water according to directions on a package of mortar mix. Mix it fluid enough to spread easily but solid enough to stand on its own. Make small quantities, only enough for about half an hour of work at a time (this will vary with skill of the bricklayer). Discard mortar and mix fresh when it starts to dry out or get crumbly. Stretch a line of mason's string on stakes the length of the wall and level it with a line level about 6 inches above the brick ledge, as a guide for the first course of bricks. Start at the bottom of one end of the wall. Spread mortar with a trowel 1/2-inch thick on the bottom and inside edge of a brick. Lay it in place on the ledge and press it firmly into the mortar, solidly against the wall sheathing. Set the outside end of the first brick flush with the end of the wall. Add a second brick with similar mortar and put it beside the first. Check the bricks with a level and add bricks to the end of the wall. Start the second course with a half-brick. If the end of the wall is a corner where two brick faces will meet set the first brick on the second course half a brick length inside. Set bricks so that mortar joints at the ends do not line up. Check the level periodically to keep the bricks level and solidly against the wall. Start adding brick ties after the second course. Nail one end of the rippled metal tie to the wall with a hammer and place the other end in the mortar between bricks. Space ties every 16 inches horizontally, nailed to every wall stud, and every six courses vertically, also about 16 inches. Keep mortar joints even, 1/2-inch thick. Take breaks or stop work overnight at the end of a course. Lay one wall at a time, allowing space at the ends for bricks on the abutting wall to overlap. Install metal lintels across door or window openings to support bricks; you may have to adjust mortar joints or even trim bricks with a mason's saw to keep mortar joints aligned and level if door or window openings are not level. Select a brick pattern before starting. Running bond, where bricks overlap end to end, is simplest and most common, but there are many other options, such as two courses of bricks horizontal and one course vertical or a course of half bricks every third or fourth course. Practice bricklaying with a wall, planter or outdoor fireplace before attempting an exterior façade. Bricklaying is not a simple skill and is best learned by doing the work, preferably under supervision of an experienced mason.